In a modern society where people enjoy access to information 24 hours a day, 7 days a week then what should a library for the 21st century look like and offer to the public? This was the challenge put forward by South Tyneside Council in their briefing to us for The Word. ‘Make the internal activities inspiring. Why would I want to come back? Why would my daughter want to come back? Why would my mother want to come back?’ Given the relationship between the real and the virtual world in which we currently live these were incredibly interesting and relevant challenges. We felt that a true paradigm shift in the building typology was possible. The design of The Word recognizes the crucial importance of people, books, traditional media and interactive technologies, and the dynamic relationship and complex interactions between them. The human-centric design approach places the individual at the heart of the building and at the heart of the opportunity to inform, delight and interact. The immersive nature, the diversity of choice combined with powerful architecture creates, we believe a significant and civilized building which points to the future and underlines the importance of the library within our modern society. Under the theme of “Reading in a Forest”, the Siaogang Branch is not only a breathable library but also a Gold-grade green building. While a library mainly functions as a book collection center, it is also expected to offer comfortable reading spaces in catering to the changing relationship between people and books. The recent development of digital archives and e-books has had a significant influence on the operation of a library. Now, libraries do not merely serve as a place for book collecting, but also are becoming a place for integrating community reading, culture promotion and school information. Therefore, it is important to create “the ambiance for reading” in a community library, where people can sit, ponder, discuss and see the sights. Reading thus becomes a carefree life attitude and a starting point for happy learning. As a result, to make the relationship between people and books more user-friendly, different designs are created in the Siaogang Branch for different reading behaviors such as browsing, reading and studying. 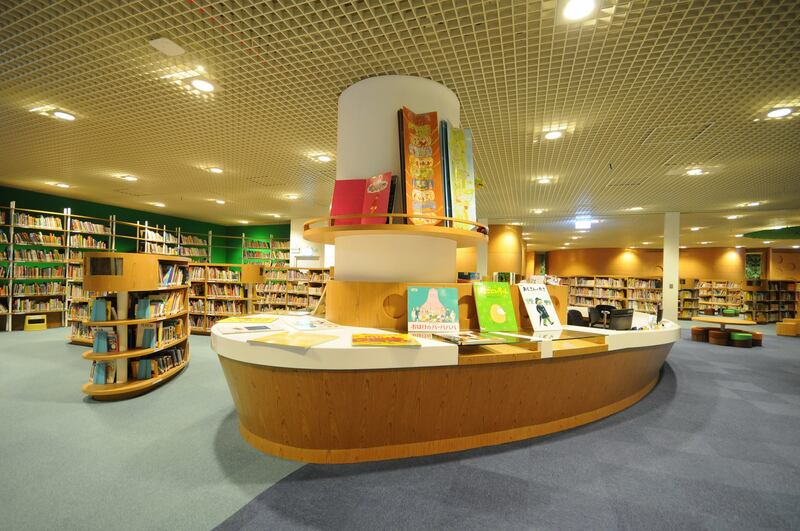 Thanks to the search screens in the shelves and chairs by the sides of shelves, the collection area and the reading area are no longer separated, but rather designed in combination. The design is aimed at different reading behaviors and bringing people and books closer. The design concept “Reading in a Forest” includes the entire building and each reading experience. “Landscape terrace” and “view borrowing” turn reading in the library into travelling in a lush-green forest. The east-side latticework shade heavily expresses the design concept “forest-like reading space.” Large French windows make the wall transparent, and smartly integrate the library with the surrounding landscape, making people unknowingly walk into a forest of books. Light thus casually scatters on the floor, bookshelves and visitors, making visitors feel like leisurely reading in the shade. Owing to the poor sight of a metal factory on the south side of the library, a landscape terrace and a horizontal shade were created to borrow new scenery. The public facilities, such as restrooms and stairs, are located on the west side to lower the heat load. The key of the library design lies in its integration with the surrounding landscape. With the architectural skin serving as a medium, the correspondence of reflections on the outdoor polished homogeneous tiles and the indoor latticework and shade makes the interior checkered with the exterior. The reading habit should be cultivated in childhood. Most residents in Siaogang are blue-collar workers. The Siaogang Branch has the largest family reading space among all the branches of Kaohsiung Public Library. Reading corners and the magic tree house are also provided to create excellent family reading space. Sustainable architecture: Cladding for buildings corresponding to the subtropical climate in Taiwan. Cladding for buildings is not only the main interface of the indoor space, but also the key to sustainable architecture. Carefully-designed cladding for buildings can minimize the indoor energy waste and facilitate indoor natural lighting and ventilation. Considering factors such as each vertical shade, heat load of the roof, ventilation, lighting, illuminance, and so on, the building project of the library won the Gold-grade Green Building in eight indicators. In 1953, the Providence library was established on Fuhsing Road in Taichung, Taiwan. In 1964, it was officially named the Luking Library in honor of Mother Marie Gratia Luking, the founder of the college. In 1988, when the university relocated to its present site in Shalu, the library holdings were moved to a brand new building. In 2005 a major extension to the library was completed, and since then the library has undergone a major renovation of space which saw completion in 2015. 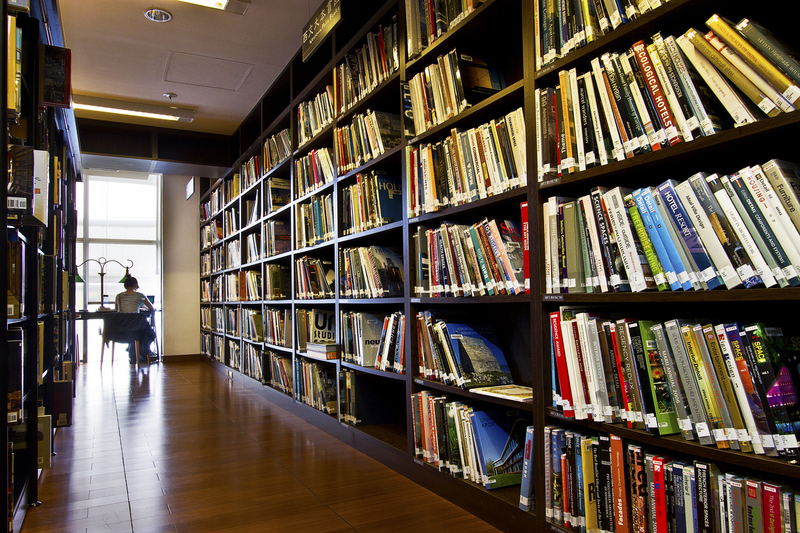 Luking Library is now listed as one of The 10 Libraries You Must Visit in Taiwan. The library holdings that amount to approximately 1,500,000 items include books, journals, newspapers, audio-visual materials and on-line resources. Books in English Literature, American Literature, and Children’s Literature are featured. 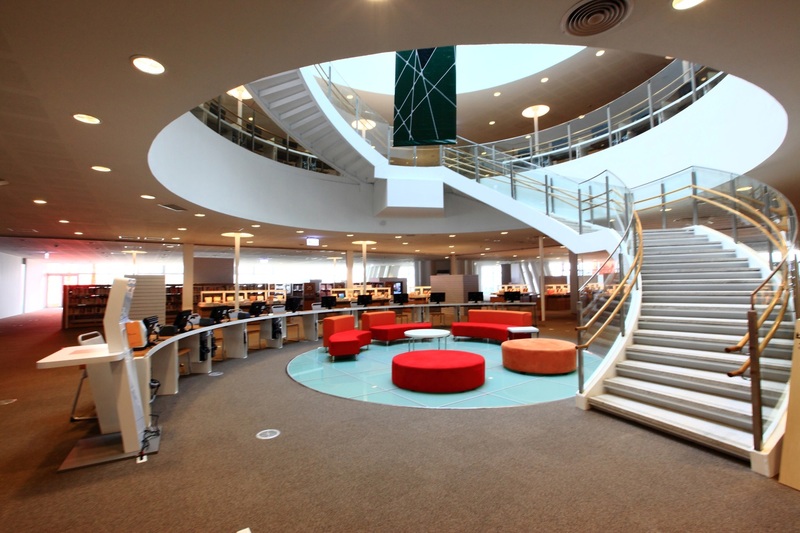 The space in the Luking Library is based on a user-demand principle. The goal of this design is for library users to enjoy multiple ways of reading and self-study that will stimulate great ideas. When you enter the library, the first place you notice is the Book Display Area. Here the library commonly places books grouped under special themes, including the nine subjects of the library archives, new arrivals, festivals, and current issues. Benches, couches, chairs are set under natural lighting so that users can comfortably spend their time in this area. Besides the traditional book exhibition, different brands of electronic tablets are available next to the Book Display Area for users to enjoy the fun of e-book reading and to experience the difference between reading on paper and reading on screens. If one wants to find a good place to read throughout the library, there are many choices. From the First to the Fourth Floor, there are separate corners presenting the concepts of time, maze, writer’s corner and nostalgia. On the Third Floor, there is a nice, cozy open space for reading and relaxing, featuring bean bag chairs and several shelves with comics. The library is meant to be a friendly place for optimum use. 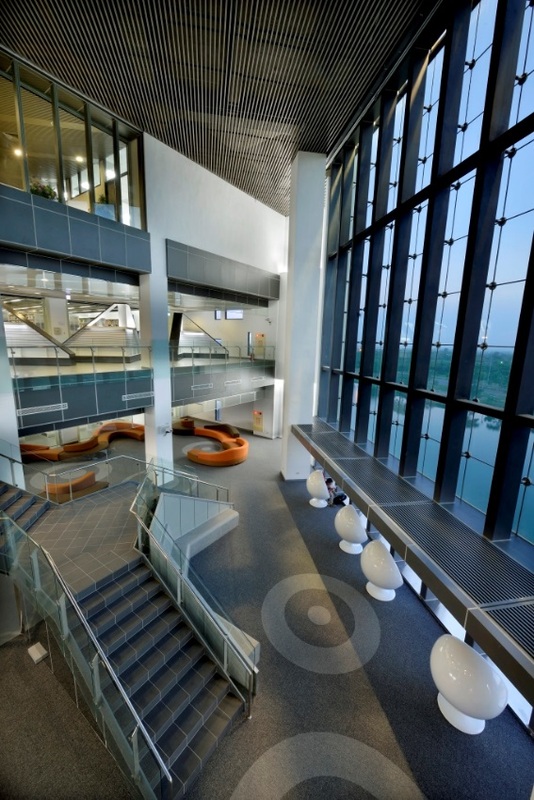 A learning commons is provided on the Second Floor and discussion rooms are located on the Third Floor. Both contain chairs, tables, and electronic equipment for patrons’ use. The offering of group study space in the library is one of many methods used to inspire and advance research, teaching, and life-long intellectual growth. Finally, there is a comfortable new space on the Third Floor called the Reading Salon. With a high-ceiling design, it’s not only good for reading, but for holding events such as speeches by authors, movie appreciation, classical music performances, summer reading camps and Asian tea ceremonies to experience the art of living. Our librarians also plan special events for library users. Through these activities, we hope that all users will learn to take advantage of all that the Luking Library has to offer. At the beginning of each new semester, the library holds a “Teacher Appreciation Tea Ceremony” to emphasize the etiquette within the art of living. 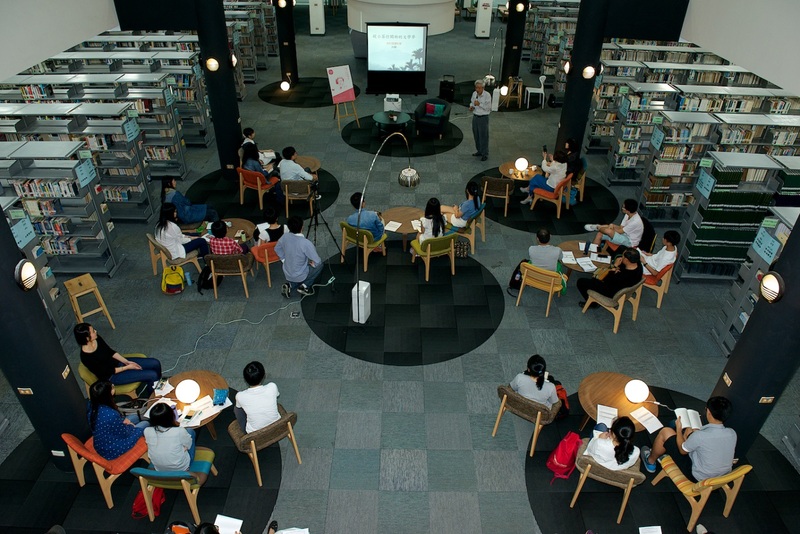 For regular activities such as “Read, and Think Differently” (Book思異), various artists, scholars and performers are invited to share their experiences with the audience. During summer vacation, a summer camp is offered to elementary school students from the countryside. The children spend three days and two nights in the library engaging in activities that focus on building their reading and writing skills. The library also holds training sessions and workshops for its regular users and helps them to set the foundations for lifelong-learning. With a positive attitude toward all library users, we provide accurate and professional, immediate replies to all requests. For more information about the library events please go to Luking Library FB fan page. 2011 Cooperate with Hyweb Technology Co., Ltd. developing Library Automation system. Street Address: Jhihben Campus: 369, Sec. 2, University Rd., Taitung, Taiwan, R.O.C. National Taitung University located in Taiwan East Coast between the mountains and the sea. The campus green belt is connecting the imagination of these two physical elements. The library adjacent to an ecological detention pond is located at the green axis endpoint toward the Pacific Ocean. As a major landmark building of the campus, library attempted to respond to mountain and water context in a landform architecture, to explore multiple imagination of campus life while creating unique campus environment in Taitung, and to make college life a profound memory. Massing concept tries to respond to two major concerns for site configuration and massing articulation; First, to link living route between the main living quarter, the school area and the lake area; Second, to respond to visual conditions of the surrounding. Massing volume is created in an abstract mountain shape on north part to form the most important scene facing the Pacific Ocean. Along the lakeside is a set of curved low volume of library. The intercrossed location of two sets of volume forms the library’s main entrance. 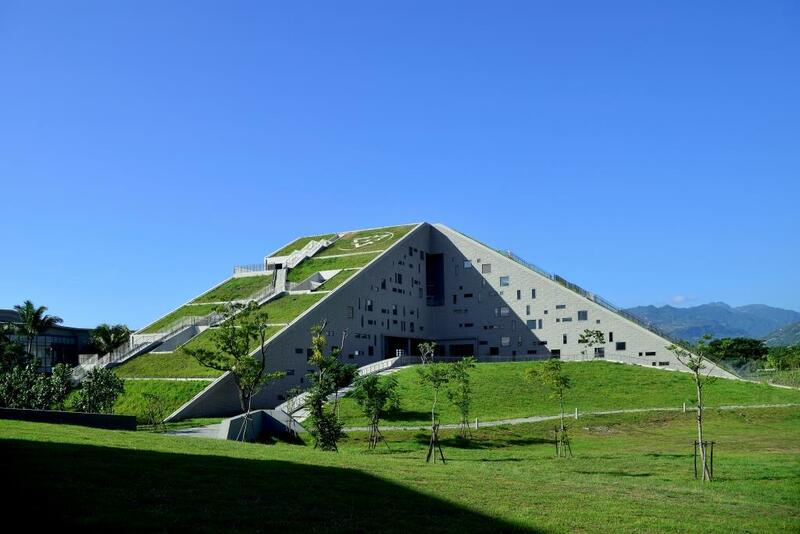 Mountain shape library becomes the visual landmark of the campus and blends into the mountain background of campus. Inside the building, the visitors being under effect of the scenic views outside and the cave like space inside which brings the atmosphere into a spiritual place. Outside the building, visitors can climb up the building to the top and overlook the surrounding to get the sense of context impact. The Library and Information Center provides support to students and faculty members in learning, research, and teaching. Centrally located on the campus, the library is surrounded by the Administrative Services Building, College of Humanities, Teachers College, College of Science and Engineering, Jing-Sin Instruction, and Student Dormitories. It is also surrounded by the protection forestland and the Jing-Sin Lake. 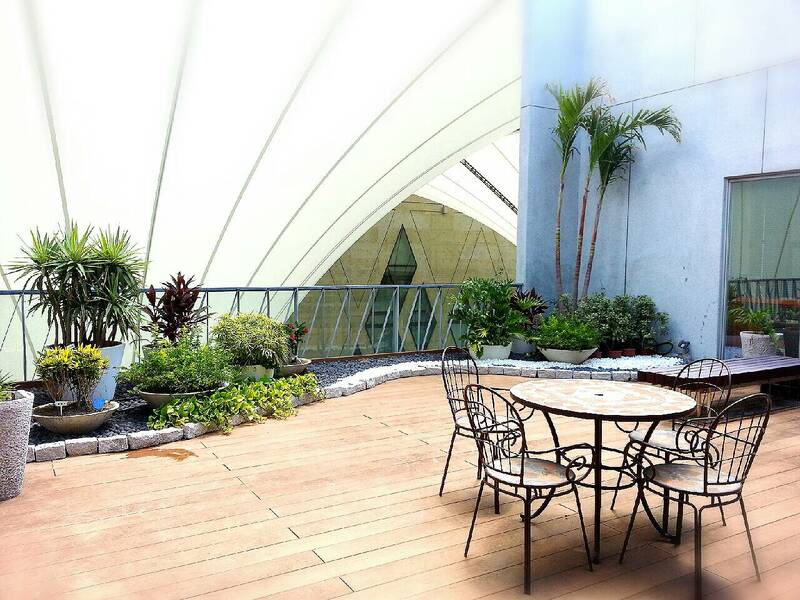 On the rooftop of the building, there is the view of magnificent Pacific Ocean and Taiwan Railway South Link Line. 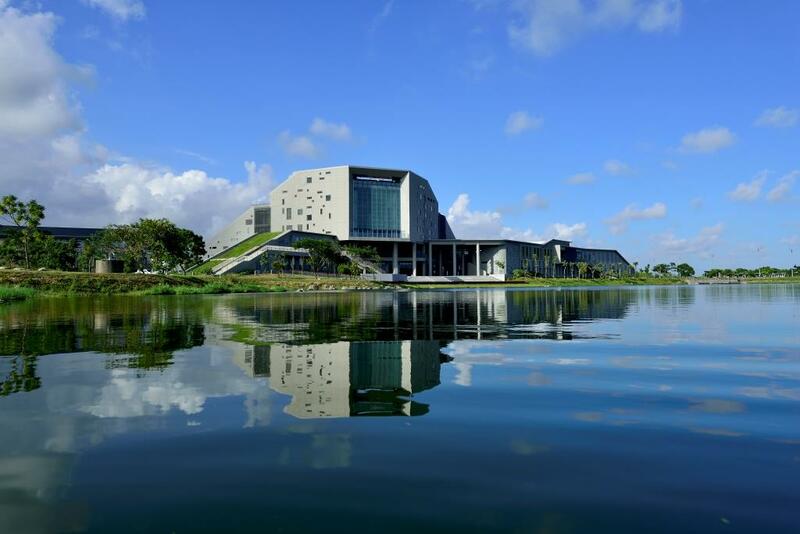 It is not only the campus landmark, but also the spotlight of Taitung. 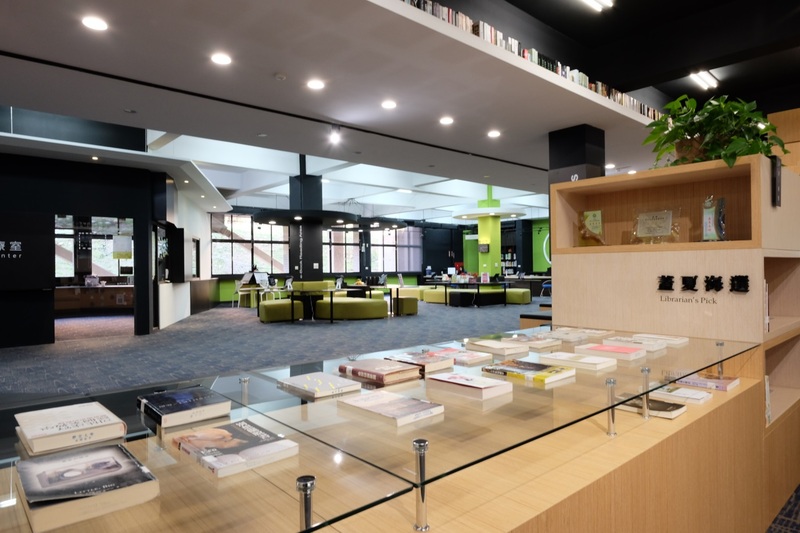 Designing to meet readers’ needs and emphasizing on mobile learning, Expect books and journals area, the library provides a spacious environment and high-tech equipment for readers to explore. The NTTU library and Information Center provides readers with comfortable study environments and state-of-the-art facilities, hoping readers can find the most suitable study space. 1F On the first floor there are Learning Commons, Discussion Room, Language Learning Area, Multimedia Area, New Arrivals, Multifunction Showroom, Lecture Hall, and Computer Laboratory. This is the most popular area in library. 2F The study rooms that are divided into the Silent Reading Area and the E-Reading Area, as well as the Library Café that serves coffee and light meal. 3F Speaker’s Corner is a great place to hold a book launch party or give a small lecture. There are abundant and valuable materials on children’s literature on this floor. 4F There are Study Carrels. Nine individual study rooms, named after the seven groups of Taiwanese aborigines in Taitung and the university tree, are available for the NTTU students and faculty to use with no disturbance. 5F Gallery of University History showcases the history of NTTU and its development. It is also the best starting point to know more about NTTU. Dadong Arts Library was initially designed as a two-floor building of 800 “pings” (about 28467 square feet). After the city-county consolidation at the end of 2010, Mayor Chen Chu expanded this library to a three-floor building of 1118 “pings” (39782 square feet) in total as the first public “arts library” nationwide, in order to establish and enhance the education and the knowledge in aesthetics to further promote the artistic appreciation of the public. 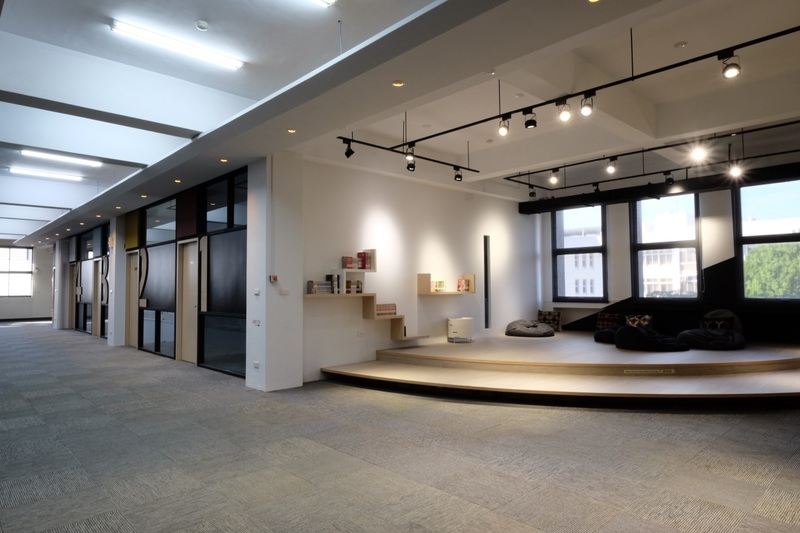 Through the elaborately constructed reading space and information platform, Dadong Arts Library is expected to become the center of artistic resource and provide reference service to the public in southern Taiwan. The collections include materials in cultural art, music, architecture, sculpture, painting, calligraphy, photography, craft & metalwork, dance, drama, movie, and animation, 12 categories in total. The library purchases the world’s most classic and best-selling art books, journals, posters, publications by domestic and international arts centers, and audio-video materials, such as operas, musical and theatrical plays, and art archives and e-books. In addition, there are children’s arts books and picture books, especially set up for kids. Many remarkable and classic public buildings in Kaohsiung with their unique architectural aesthetics make Kaohsiung the model for the other cities in Taiwan. With the generous donation and strong support from the Kaohsiung Architects Association, the “Architectural Esthetics Area” was established to help the city shape the new style of urban aesthetics, create an environmental sustainability, and develop a leading vision for urban fashion by introducing the contemporary architectures, landscapes and designs. Comfortable spacious seats, five for music listening and ten for watching video, and infrared wireless headphones are available for the public to enjoy arts audio-video materials. Please go to “Audio Visual Room” and select desired disc, and then apply for the service with personal library card or ID card at the Information Desk on the second floor. On-site application is required and available seats are only for the date of application. Featured arts E-books are available for online reading. Chinese and international arts databases are provided to the public for the inquiry and research use. Wireless internet connection is accessible within the library for the public to bring with their mobile devices to surf the Internet. Please go to the Information Desk to make registration and obtain access account and password (valid for the date issued only). We also provide tour guide service to help readers become acquainted with the library environment, and to learn how to use each service. Please feel free to make a reservation. Please download and fill the application form, and fax it to +886-7-7432233 or hand it to the Information Desk, your application will be processed. 2012, Silver Award in the International Awards for Liveable Communities, Projects-Built category. As a gift to the citizens of Kaohsiung city, the Kaohsiung Main Public Library’s permanent commitment is to not only provide citizens with rich collection and a multifunctional facility for reading, learning and recreation but also connect citizens to the community and world and cultivate citizens with vision. Since the establishment of the library in 1916, it has been renamed three times and relocated 6 times. In 2009, for the old main public library building came to be inadequate and obsolete, the plan for a new main public library building was drawn up. After five years of evaluation, arrangement and execution, a new main public library became a reality in 2014. Meanwhile, it’s also a cultural landscape and city landmark, showing and displaying creativity, energy and sustainability. The construction of the new library is based on the result of an international design competition. The winning design is from the collaboration between Ricky Liu and the Japanese architect Toyo Ito’s team. The architectural techniques applied in the new library building are unique for the use of suspended steel rods contributing to lightweight construction as well as glass curtain walls, making it the most spatially penetrable library in the world. In order to create the spatial penetration of the ground floor and achieve the column-less structure of the first floor, box steel columns, tubular columns, buckling restrained braces (BRB) and other structural components are used as support columns. These support columns are integrated with the eighth floor truss level to comprise a three-dimensional “large-scale frame”, thus forming the principal structural system of the library’s construction. The building possesses four elevators and two escalators with modern design, which adopts the “suspension method” and utilizes steel tension of the most economical design principles. Suspended steel rods of 6 to 12 centimeters in diameter were adopted in place of traditional structural column sections (90 centimeters X 90 centimeters for a vertical structural column section). This downward construction method is completely different from the upward one of common architectural structures. The suspension method employed in the structure of the library makes the columns of the ground floor gone like magic and endows the interior space with the visual permeability as well. 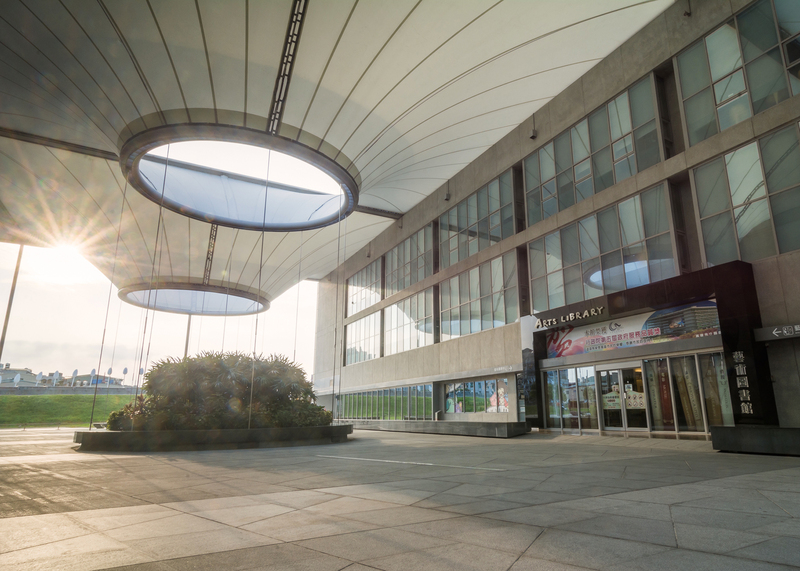 In addition to the building, another distinctive feature of the new main library is that the accomplishment of the library stands on the cooperation between the Kaohsiung City Government and citizens. For the structure, the construction and NT$1.9 billion funding are covered by the Kaohsiung City Government. For the collection, the Kaohsiung City Cultural Foundation particularly initiated a donation plan called “One Million Books by Donation; Love and Wisdom Passed on for Generations” for making the new main library, the first municipal library built by the city in the last twenty years in Taiwan, house a collection of one million books. Through the project, the donations from various walks of life reached NT$500 million, actually having been increasing, and the goal of one-million-book collection was achieved. To express the library’s appreciation of the donors, the flyleaves of books are with sponsors’ names on them and some floors are named after the entrepreneurs desiring to make contribution to the society. The most significant meaning of the donation manifested through the completion of the library is that no matter whom you are, a rich industrialist, an ordinary salaryman, or a vendor, you have the power to make the city and world different and better. With the constant support and passion of the citizens, which are deeply appreciated, the library will grow steadily and everlastingly with the knowledge and power shown in itself. In the collection and among the bookshelves, one of the distinguishing characteristics of the new main public library－“Key Publication Showcase” displayed elegantly. The key publication showcases, located on the fourth to seventh floors, exhibit more than five hundred classic books from different eras and fields which are all carefully and rigidly selected. These books are collected from various publishers, used bookstores and the data preservation center of National Central Library. They are also obtained from the ancient relic collectors as well as the community. As time goes by, these monographs become much rarer and more precious. Through the exhibition, people can take a look at the key publications, appreciate these crucial classics in publishing history, and understand the meaning and influence of knowledge to human beings. Each book of key publications tells a timeless story, which brings library patrons to the magnificent worlds of different times. The Library was conceived in 1987 when its planning began, with formal public opening in 1989. Its establishment constitutes not only the first collection in the entire world of treasures of Chinese dietary culture, but its free service to the public also comprises the ideal long cherished by the Mercuries Group of serving the Community that had given it its prosperity. 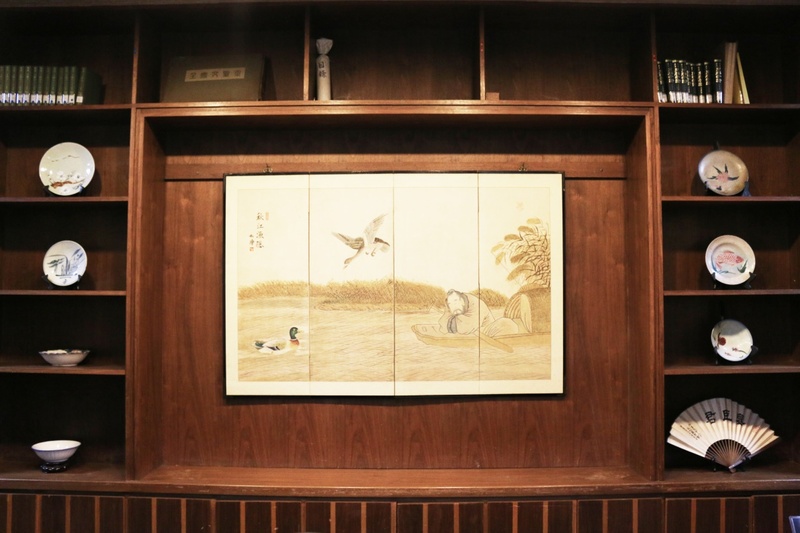 During the initial stages when the Mercuries Building was being constructed, the company was already considering the establishment of a library devoted to Chinese traditional food culture and in the process consulted experts from many quarters. And in accordance with the desire of Chairman Mr. George, Chau-Shi, Wong to collect all such texts from the world over, after a period of two years’ planning, the Library was formally opened. 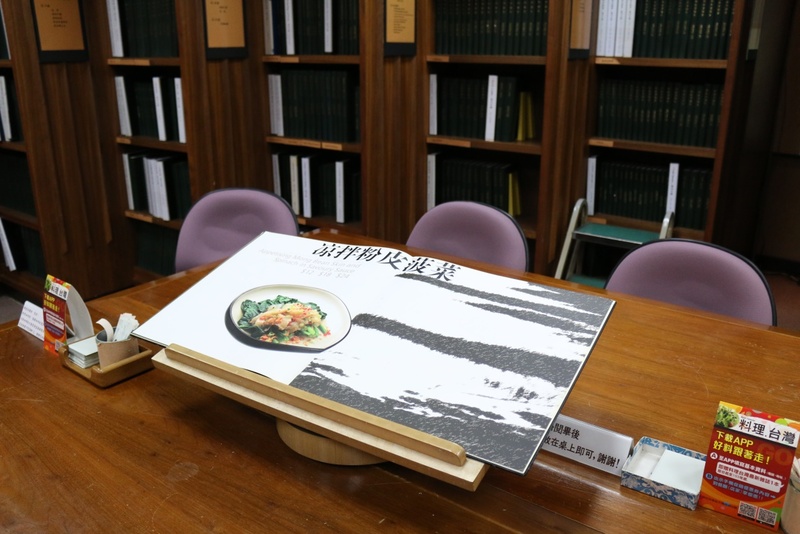 In order to promote Chinese food culture actively, the Mercuries Group decide to extend the scale of Library to be a Foundation. The Foundation of Chinese Dietary Culture was founded in 1989, the Library of Chinese Dietary Culture has been involved as part of Foundation. Nowadays, this Foundation is a private foundation for the research and transmission of Chinese food. Over the past several years, the Foundation has gradually taken shape, earning recognition from all social sectors. And from its actual implementation and activities, the Foundation has come to know that its work in some measure has contributed to promoting such awareness, and hopes with the help of scholars and through inter-disciplinary approach to lift research in dietary culture onto an academic level. For this the Foundation has already sponsored several international conferences on Chinese Food Culture, and on Food and Beverage Management. It has also provided scholarship funds for M.A. and Ph.D. candidates working on related theses, assisted in the publication of related academic works, and published collected papers. Moreover, it has made available to the general public its library resources, its search and retrieve facilities as well as its library staff. Recently we have participated in all manner of scholarly activities in order to reach the goal of organizing and exchanging our resources.